A huge gathering of fans, friends, family members and prominent figures from the world of sport attended the funeral service for the MotoGP rider who passed away on Sunday. The funeral was held at 3pm on Thursday at the Santa Maria Assunta church in Coriano, Simoncelli’s hometown, close to Riccione in the Italian province of Rimini. 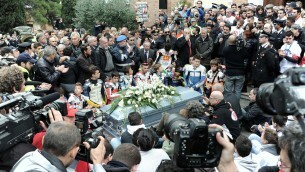 The casket arrived at the Assunta church carried by friends and members of the Gresini team, and at 3pm the service commenced. Simoncelli's Gilera bike, on which he won the 2008 250cc World Championship title, and the Honda RC212V, on which he competed in the MotoGP class were displayed on either side of his casket. The ceremony was broadcast on a large video screen outside of the church, as well as on an additional large screen installed at the nearby Misano circuit, so that those outside of the church and at the circuit could witness the ceremony. Prior to the service the screens ran footage of the 24 year-old at his charismatic best in the paddock. Alongside Marco’s father Paolo, mother Rosella, sister Martina and girlfriend Kate, in attendance were current and former fellow riders including Valentino Rossi, Giacomo Agostini, Alex Criville, Simone Corsi, Yuki Takahashi, Raffaele de Rosa, Chaz Davies, Mattia Pasini, Manuel Poggiali, Jorge Lorenzo, Andrea Dovizioso, Randy de Puniet, Loris Capirossi, Toni Elias, Hiroshi Aoyama and Alex de Angelis. Also present at the services were FIM president Vito Ippolito and CEO of Dorna Sports, Carmelo Ezpeleta, who commented on the services.